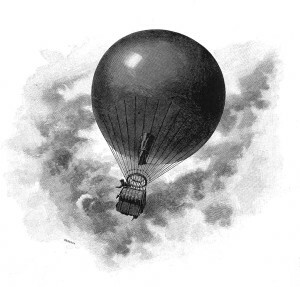 On the afternoon of July 25, 1894, a balloon ascension – parachute drop was scheduled to take place at Railroad Grove near Savin Rock, in West haven, Connecticut. Miss Louise Bates, it was advertised, would drop from a balloon using a parachute. 2,000 spectators reportedly arrived to watch the event. The ascension was scheduled for 4 p.m., but for unspecified reasons was delayed until after 5 p.m. When the balloon was finally released, it floated very slowly upwards. When it reached an altitude of about 150 feet, it was caught by a slight breeze and began to sail off in an easterly direction over some trees and towards the Ocean Inn. At that time Miss Bates made her drop, but due to the low altitude of the balloon, the parachute didn’t have time to open properly. She fell rapidly and landed in the upper branches of a tree which broke her fall. Fortunately she was not seriously injured, and was rescued a short time later. Meanwhile, the balloon sailed off on its own without a pilot, and was recovered later in the evening near City Point in the neighboring town of New Haven. After her ordeal in the tree, Miss Bates stood with her manager, Mort McKim, before some of the spectators. Mr. McKim explained that the reason the balloon had failed to rise was due to a pole which had fallen against it when it was released. The pole had created a tear in the balloon which had allowed gas to escape. Miss Bates had decided to make her drop anyway so as not to disappoint the crowd. Despite the explanation, comments were made about the disappointing quality of recent balloon ascension given in the Savin Rock area. Such ascensions, it was hoped, would draw crowds and boost local economic ventures. This accident wasn’t the only close call Miss Bates experienced during her parachuting career. About five years earlier, on July 6, 1889, Miss Bates was scheduled to make a parachute drop at Deal Lake in Asbury Park, New Jersey. The balloon had drifted over the water, and was at a height of 1,500 feet when it suddenly began to loose altitude. Miss Bates dropped with her chute, but it failed to open properly, and she splashed down into the lake narrowly missing a rowboat. She then became entangled in the parachute lines and almost drowned before being rescued.